Material gains can’t make a person the happiest on Earth. Meditation however, can. 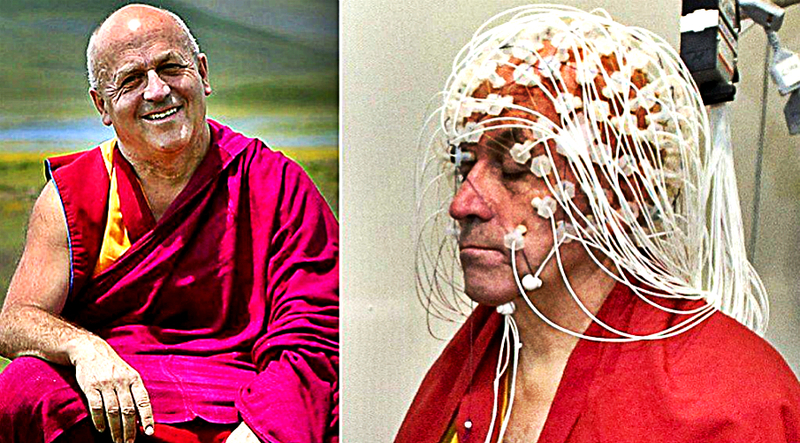 The Tibetan Buddhist monk Matthieu Ricard is the world’s happiest man, according to a research, and it’s all thanks to his way of meditating. Ricard is a Frenchman who moved to India to study Buddhism. He is a close associate of the Dalai Lama and is one of the many meditation practitioners who become part of a 12 year study of the effect of short and long term mind training through meditation on attention, compassion, and emotional balance. Researchers found that when meditating on compassion, Ricard’s brain produces a level of gamma waves associated with learning, memory, attention, and consciousness. They believed that the monk’s secret to happiness lies in compassion and that his prefrontal cortex is more active than the right one. This gives him the capacity to feel more happiness and less tendency towards negativity. If this is the secret to happiness, we should try it ourselves. Thankfully, Ricard is very generous in sharing his meditation tips to achieving the ultimate happiness he possesses. 1. Let your mind act like a mirror. A mirror is where you see your reflection but is not bothered too much by it. Do the same with your mind. Allow your thoughts to stay there without getting overly bothered. Let them reflect the world around you and do not take them too seriously. 2. Calm your mind through deep breathing. It is in your mind’s nature to generate thoughts. You can’t control these thoughts but you can control your focus and deep breathing can be of a big help. As you focus on your breath, your mind stays calm despite the coming and going of your thoughts. While having your focus on your breath, pay attention to the sensations of your breath. Focus on the sounds it makes, the heat, the cold, and anything associated with it. Try to feel as it refreshes you. Try to feel how it energizes and awakens you. 4. Focus on the all consuming love. Matthieu Ricard states that the feeling of an all consuming love can last only for as much as fifteen seconds when you first encounter it. But when you meditate and focus on it, you cannot only lengthen its duration, you can make it a part of your natural state too. 5. Practice meditation for 20 minutes a day. You can’t achieve the benefits of meditation unless you dedicate to the practice even for 20 minutes a day. When done regularly, this will create a big impact on your life. It’s just like a plant that needs constant watering to grow and thrive. 6. Bring your negative emotions into awareness. Contrary to what you’ve been taught, negative emotions like anger or anxiety need to be brought to light in order to process them, heal and let them go. You can meditate on them by bringing them to your awareness. When you’re aware that anger or anxiety is in you, you detach yourself from identifying with them. Ricard says, “You can look at your experience like a fire that burns…” As the fire burns down, so do your negative emotions. 7. Give yourself the exact reason why it pays to meditate. Because meditation does not guarantee a quick fix, we tend to push it aside and continue to rush our day instead. Stop doing this if you really want to get as happy as Ricard. Meditation is a big help in establishing the theme running your day. If you fail to meditate, your fears may take charge of the scene and what you dreaded to happen will eventually take place. This is just one simple benefit that meditation can give you. Giving your mind this training daily for a week, a month, a year or years could possibly take you to the path that Ricard is already walking, the path to boundless happiness.